L-intervista ta’ Marlene fuq Reporter ta’ nhar it-Tnejn li għadda hi xhieda tal-idealiżmu tagħha. Baqgħet tittama li l-partit li f’ismu ġiet eletta fil-Parlament jiftaħ għajnejh u jirrealizza illi għandu programm elettorali li wiegħed li jwettaq. Tħoss li l-iktar rabta importanti tagħha hi mal-programm elettorali u mhux mal-partit li bosta drabi jidher li nesa’ dak li wiegħed. Għalhekk għażlet li tkun indipendenti. Tinsisti li hi baqgħet lealissima lejn dak li ġie imwiegħed biex inkisbu il-voti fl-elezzjoni ġenerali. Huwa dan li jimmotiva l-ħidma tagħha, għax, għaliha, l-lejaltà lejn l-idejal fil-politika tiġi qabel il-lejaltà lejn il-partit. Għax il-partit mhux qiegħed hemm biex jistaħbew warajh! Fuq quddiem fil-lista tad-diżappunti ta’ Marlene hemm in-nuqqas ta’ trasparenza fil-ħidma tal-Gvern. Hemm ukoll il-privatizzazzjoni tal-Enemalta b’sehem fiha issa f’idejn is-Shanghai Electric Power (ksur sfaċċat ta’ wegħda elettorali Laburista), n-nuqqas ta’ politika ambjentali sura u bosta affarijiet oħra. Marlene vuċi fid-deżert? Ma jidhirx li kien hemm wisq appoġġ għall-posizzjoni tagħha fil-grupp parlamentari laburista għax bosta kienu dawk li beżgħu mir-riperkussjonijiet fuq il-karriera politika tagħhom kieku għażlu li jlissnu kelma. Dan minkejja li l-grupp parlamentari laburista ġie imġenneb diversi drabi: kien isir jaf b’diversi deċiżjonijiet mill-gazzetti. Quddiem dawn l-affarijiet kollha, hu ta’ sodisfazzjon li Marlene għadha titbaqbaq favur l-idejal : li sservi lin-nies, dejjem b’konsistenza mal-programm elettorali li tpoġġa quddiem l-elettorat f’Marzu 2013. Għaddej ħafna paroli bħalissa dwar dawk iż-żewġ siġġijiet li l-Qorti ordnat lill-Kummissjoni Elettorali biex tagħti lill-PN. L-istorja hi ħafna iktar ikkumplikata minn hekk. Fl-elezzjoni ġenerali tal-2013 il-Partit Laburista rebaħ 39 siġġu Parlamentari u l-PN rebaħ 26. Dwar tnejn mis-siġġijiet li rebaħ il-Partit Laburista kien hemm l-iżbalji. Qed nirreferi għas-siġġu Parlamentari li rebaħ Edward Scicluna fuq id-Distrett ta’ B’Kara (8) u għas-siġġu Parlamentari fuq id-Distrett ta’ Għawdex (13) li rebħet Justyne Caruana. Li kieku ma sarux l-iżbalji flokhom kienu jitilgħu Claudette Buttigieg u Fredrick Azzopardi. X’għandu jiġri mela? Il-loġika tgħidlek li jekk il-Qorti ikkonfermat l-iżball il-Kummissjoni Elettorali għandha tkun ordnata tikkoreġi l-iżball. Hemm mod wieħed kif jiġi ikkoreġut l-iżball. Dan isir billi ir-riżultat finali issirlu korrezzjoni. Fit-tmien Distrett flok Edward Sicicluna titla’ Claudette Buttigieg u fit-Tlettax-il Distrett flok Justyne Caruana jitla’ Fredrick Azzopardi. Dan ifisser ukoll li r-riżultat finali flok ma jaqra 39 siġġu għall-PL u 26 siġġu għall-PN jibda jaqra 37 siġġu għall-PL u 28 siġġu għall-PN. Id-differenza ta’ siġġijiet bejn il-PN u l-PL ma tibqax 13 imma issa issir 9. Dan kollu jfisser li wieħed ikun irid jara mill-ġdid jekk ikunx hemm ħtieġa illi tkun applikata l-emenda Kostituzzjonali li tirrestawra l-proporzjonalita’ billi iżżid is-siġġijiet. Some, myself included, have received an SOS from the PN. The PN needs “our” input. It implores those receiving its SOS that it urgently requires the inputs of well-intentioned volunteers. 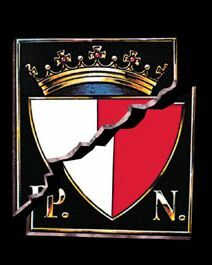 Today’s PN leadership wishes to rebuild the party. That is, it wants to reconstruct what its predecessors have demolished. Now such an exercise requires first and foremost an accurate appreciation of how and why the PN is in its present state. When one reads through the report analysing the circumstances which led to the PN’s routing, which report was coordinated by current PN Executive Committee President Ann Fenech one can get an inkling as to why the PN is in a state of shambles. This comes through not just by reading the actual report (at least that part of it which is public) but through the line of thought which links each of the 38 pages of what is described as an Executive Summary of the actual report. Apparently, according to the Ann Fenech report, everyone is at fault, except the PN. The PN was misunderstood and misinterpreted. Ann Fenech’s report speaks of authorities and civil servants who “sabotaged” the PN-led government. Unfortunately Ann Fenech fails to bring this argument to its logical conclusion: that the PN Ministers and their private secretariats were an incompetent bunch if they did not notice this “sabotage” and take the appropriate action. They were even assisted by Boards, and Committees leading Authorities, sometimes at an exorbitant rate of pay, who at times were more of a rubber stamp than an Authority. If this reasoning is not analysed and acted upon the reconstruction exercise will be futile as the foundations are the result of a very weak reconstruction philosophy. 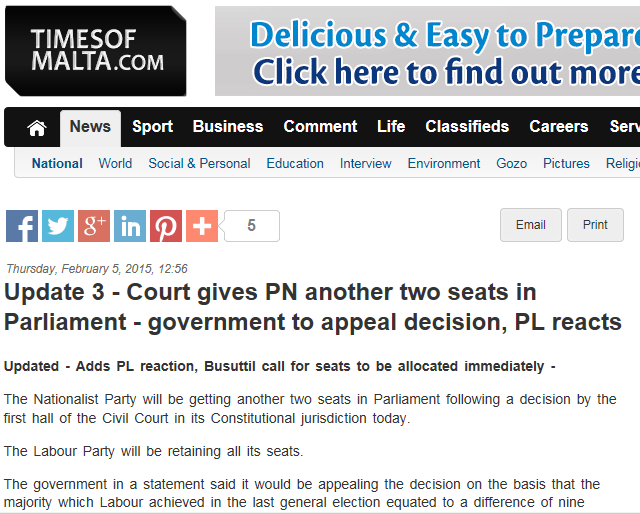 The PN has still not apologised for defying the divorce referendum result in Parliament. Nor has it sought absolution from the cultural community for defying reason in its persistence on the roofless theatre at the Royal Opera House site in Valletta. The PN’s stance on the roofless theatre was one which left no doubt that in the PN’s view everybody was in the wrong, except the PN. 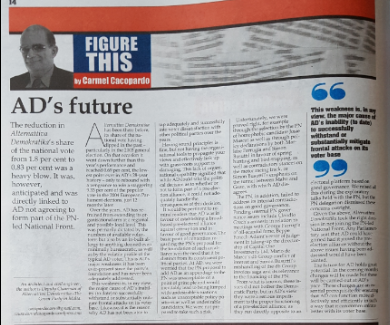 The PN’s arrogance and its lack of social conscience personified in former Minister Austin Gatt and his entourage directing the “reform” of the Malta Drydocks as well as the Public Transport Reform seems to be a non-issue in Ann Fenech’s report. Also surprisingly absent in Ann Fenech’s analysis is the PN’s shift away from the political centre under Lawrence Gonzi’s stewardship. 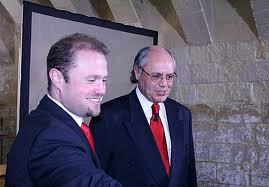 Lawrence Gonzi inherited a left-of centre PN but when he left the leadership handed over a conservative party to Simon Busuttil. Ann Fenech’s report (as published) is silent on the matter. 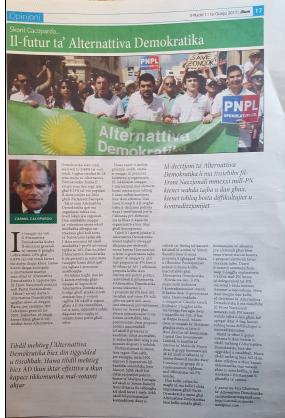 Most probably Dr. Ann Fenech and fellow co-authors Prof. Mary Anne Lauri, Dr Simon Mercieca, Ms Rosette Thake and Mr Malcolm Custó do not have an inkling as to the actual consequences of the PN in government during the period 2004-2013 moving along a conservative path. Finally there are those who consider that those who did not support the PN in the March 2013 general elections had no valid reason to do so. In their view they did so as a result of an incorrect appreciation of the situation. Some have supported and even voted in favour of specific measures adopted by the Lawrence Gonzi led government. 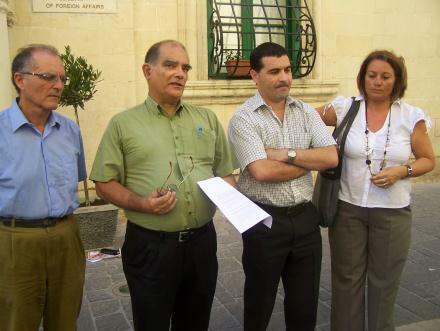 These same persons are in the forefront now in 2014 supporting residents who are protesting against these same measures originally adopted by the PN led-government. How is it possible for the PN and its leadership to be credible when some of its MPs act in this manner? Crocodile tears will not lead to a reconstruction of the PN. Dal-għodu ħarġet l-aħbar li l-Laqgħa Ġenerali Annwali ta’ Alternattiva Demokratika liema laqgħa kellha issir nhar is-Sibt li ġej, ġiet posposta. L-aħbar ħarġet f’ċirkulari li bagħat lill-membri s-Segretarju Ġenerali ta’ AD. Huwa ma tax biss l-aħbar. Ta ukoll ir-raġuni għal din id-deċiżjoni li ttieħdet mill-Kumitat Eżekuttiv ta’ AD nhar is-Sibt li għadda. Id-deċiżjoni ittieħdet minħabba li ma daħlet l-ebda nomina għall-kariga ta’ Chairman ta’ AD sal-ħin tal-egħluq tan-nominazzjonijiet. Uħud qed jistaqsu: kif, għaliex qed jiġri dan wara li AD kisbet l-aħjar riżultat f’elezzjoni ġenerali? Dan il-kumment jeħtieġ tweġiba. Huwa veru li AD kwantittattivament kisbet l-aħjar riżultat f’elezzjoni ġenerali: 1.8% tal-voti validi jew 5506 voti. Kienet ukoll l-ewwel darba li f’ċirkustanzi ta’ bidla fil-Gvern AD ma naqqsitx fil-voti. Dan huwa ukoll sinjal pożittiv. Wieħed iżda jrid iqis l-istampa kollha u ma jarax biss dawn il-1.8%. 1.8% kien ikun riżultat eċċellenti f’sitwazzjoni fejn il-partiti politiċi l-oħra jkunu ras imb’ras. Imma meta wieħed iqis li l-fuq minn 38,000 vot iċċaqalqu min-naħa għall-oħra u minn dawn AD ħadet biss madwar 1,700 vot ir-riżultat miksub minn AD ma jibqax daqshekk eċċellenti. 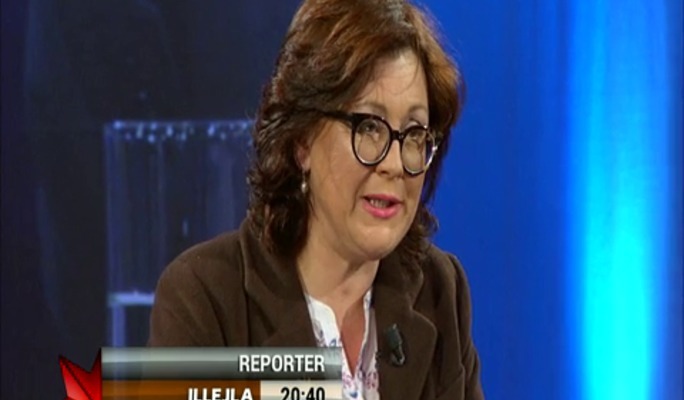 Il-ħidma ta’ partit politiku ma issirx biss lejliet elezzjoni ġenerali. Issir matul kull jum tal-leġislatura għal ħames snin sħaħ. Hemm min isegwi u jagħti każ ta’ dak kollu li jkun għaddej u jista’ japprezza kif kull wieħed minna li jagħżel li jimpenja ruħu f’Alternattiva Demokratika jrid jagħmel sagrifiċċji kbar biex dan l-impenn ikun jista’ jitwettaq. M’għandniex impjegati fuq min induru. Ma nitolbux donazzjonijiet lil ħadd. Ftit hemm li jagħtuna donazzjonijiet u kemm kemm iservu għall-ħidma li nagħmlu. Kull wieħed minna mhux biss jaħdem fil-partit b’mod volontarju, talli huwa meħtieġ ukoll li naħdmu biex naqilgħu x’nieklu matul il-ġurnata. Il-ħidma mhux żgħira li jirrikjedi anke partit ċkejken bħal AD kull ma jmur tagħmilha iktar difficli għal kull min jagħżel li jimpenja ruħu fil-partit li jlaħħaq ukoll mal-obbligi l-oħra tiegħu jew tagħha. Il-konsegwenza hi li inqas nies jinvolvu ruħhom u l-piz jaqa’ dejjem iktar fuq numru żgħir ta’ nies. Piz ikbar li mhux dejjem nifilħu għalih. Dan la huwa sewwa u l-anqas ma’ huwa aċċettabbli. Fid-dawl ta’ dan kollu wieħed jista’ jifhem iktar għaliex mhux faċli li toħroġ għonqok, iktar u iktar meta r-riżultati li tara mhux dejjem jagħmlulek wisq kuraġġ. Id-direzzjoni li ser tieħu AD jiddependi minn x’posizzjoni ser jieħdu dawk li jappoġġawha. Jekk ikun hemm iktar appoġġ li jinbidel f’impenn, il-futur hu wieħed sabiħ. Min-naħa l-oħra jekk l-appoġġ jibqa’ wieħed ġeneralment passiv allura m’għandix idea fejn sejrin. Il-gazzetti tal-lum, kif ukoll is-siti tal-aħbarijiet online jitkellmu dwar ir-respons internazzjonali għas-sejħa ta’ interess li għamel il-Gvern biex jibni power station li taħdem bil-gass kif ukoll biex eventwalment jaqleb għall-gass ukoll l-impjant tal-BWSC. L-issues illum għadhom l-istess kif kienu waqt il-kampanja elettorali b’xi differenzi żgħar imma importanti. L-ewwel punt importanti dejjem kien u għadu li l-gass iħammeġ inqas mill-heavy fuel oil li qed jintuża illum. Indubjament dan iwassal biex titjib il-kwalita’ tal-arja fl-inħawi madwar Delimara. Kemm ser jiswa’ l-gass u x’garanzija ta’ prezzijiet jista’ jkun hemm? X’joffri is-suq? Waqt il-kampanja elettorali il-Partit Laburista kien qalilna li is-suq joffri garanzija ta’ provista’ ta’ għaxar snin liema garanzija tfisser prezz fiss għal għaxar snin. Imma fis-sejħa li ħarġet dawn l-għaxar snin jidher li diġa niżlu għal ħames snin. Jiġifieri diġa hu ċar li ma jistax ikun hemm garanzija ta’ prezz u ta’ provista għal 10 snin. Jekk il-proposti sottomessi l-bierah jindirizzawx din l-issue jew le għad irridu naraw. Waqt il-kampanja elettorali, xahrejn ilu, diġa kien jidher li kien ser ikun diffiċli li jkun hemm garanzija ta’ prezz u provista għal iktar minn tlett snin. Forsi tgħiduli li fin-negozju kollox possibli sakemm tħallas! Huwa veru, imma għad irridu naraw kif dan kollu ser ikun rifless fin-nefqa u fl-aħħar fil-prezzijiet. Għax il-problema qatt ma kienet dwar jekk hux possibli li jkun hemm impjant li jaħdem bil-gass imma kif dan ser ikun rifless fil-prezzijiet tal-elettriku ġġenerat. Waqt il-kampanja, għan-nom ta’ Alternattiva Demorkatika bl-iktar mod ċar kemm jiena kif ukoll kelliema oħra, għidna li l-proposta Laburista għall-power station li taħdem bil-gass tista’ tkun proposta tajba. Iżda l-informazzjoni dakinnhar biex issostni l-proposta Laburista kienet fjakka. Għadha fjakka sal-lum. Kien hemm u għad hemm xi oqsma li ma kienux ċari. L-ewwel: kemm hu possibli li proġett ta’ din l-entita’ jitlesta f’sentejn? It-tieni: bl-ispejjes meħtieġa kemm hu fattibbli dak li qed jgħid il-Labour Party li jorħsu l-kontijiet? It-tielet: x’ispejjes ittieħdu in konsiderazzjoni biex il-Labour Party wasal għall-konklużjonijiet tiegħu? Il-Labour Party waqt il-kampanja elettorali qal li kellu studji dettaljati lesti. Kellu ukoll konsulenti, mingħalija Daniżi, li qalu illi tali studji kienu jeżistu u li l-proposti kienu fattibbli. Imma dokumenti li jissostanzjaw dak li qal il-Labour Party qatt ma ġew ippubblikati. L-iskuża dejjem kienet waħda ta’ sensittivita’ kummerċjali. 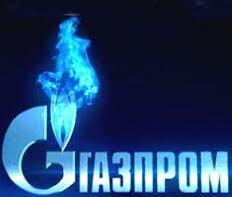 Li il-PL ma riedx jikxef idejh. It-trasparenza a jidhirx li hi l-forte tal-Labour! Ħlief ismijiet ta’ ditti rinomati s’issa m’għandniex. Dawn l-ismijiet ifissru li dawn id-ditti bħax-Shell, Gazprom, Daewoo, Edison …………… huma interessati għax f’dan l-istadju jaħsbu li hi proposta li minnha jistgħu jagħmlu biċċa business tajba. Issa jekk dan hux fl-interess ta’ Malta ukoll għad irridu naraw. Waqt il-kampanja elettorali l-kelliema tal-Partit Nazzjonalista spiss ftaħru li l-finanzi tal-pajjiż kienu fis-sod. Kellhom ċertifikat, qalulna, mill-Unjoni Ewropeja li l-iżbilanċ finanzjarju kien taħt kontroll skond ir-regoli tal-EU (Il-Patt tat-Tkabbir u Stabilita’). B’ċertifikat li l-żbilanċ finanzjarju kien taħt it-3%, kienu repetutament jgħidulna, l-pajjiż kien finanzjarjament qabad it-triq it-tajba. It-tweġiba ta’ Alternattiva Demorkatika dejjem kienet li aħna konna nieħdu pjaċir kieku l-finanzi tal-pajjiż kienu amministrati sewwa. Imma kollox kien jindika li l-affarijiet kienu differenti milli kienu qed jgħidu l-kelliema tal-Gvern: iċ-ċifri finanzjarja għal Diċembru 2012 kienu għadhom mhux pubblikati. Kollox kien jindika li meta dawn iċ-ċifri jkunu ippubblikati l-żbilanċ ser jerġa’ jisplodi. Rapport dal-għodu fl-Independent on Sunday jagħtina raġuna. F’artiklu fl-ewwel paġna intitolat : Figures show 2012 public deficit redlining at 5.4% of GDP hu ċar li s-sena 2012 kienet sena oħra disżastruża għall-amministrazzjonji finanzjarja tal-pajjiż. Waħda mill-kionsegwenzi loġiċi ta’ din l-aħbar hi li kienet irresponsabbilta’ għal Partit Nazzjonalista (li kellu iktar minn ħjiel ta’ din l-aħbar) li jwiegħed tnaqqis fit-taxxa tad-dħul. Alternattiva Demokratika biss qalitu dan waqt il-kampanja elettorali. Għax il-Partit Laburista ukoll ma kellux il-kuraġġ li jiffaċċa ir-realta. U xi ngħidu għall-ħafna wegħdiet elettorali li jiswew flejjes kbar? Minn fejn ġejjin il-flus? Id-deficit li reġa’ kiber (fil-fatt kważi irdoppja) jfisser li mhux tnaqqis ta’ taxxi ser ikollna! Jew żieda ta’ taxxi inkella tnaqqis fl-infieq! X’ser jagħmel il-Professur Edward Scicluna l-Ministru tal-Finanzi? Għandu l-kuraġġ jgħid li kemm il-PN kif ukoll il-PL għaddew lill-votanti biż-żmien? It-telfa elettorali tal-PN nhar id-9 ta’ Marzu ma ġietx f’daqqa. Ilha hemm. Is-sinjali ilhom jidhru għal min ried jarahom. Dawn is-sinjali ġew injorati sforz l-arroganza li matul dawn l-aħħar snin kienet il-mutur ewlieni tat-tmexxija tal-PN. F’Marzu 2008 l-PN ingħata warning meta rebaħ l-elezzjoni bi sbrixx: bi ftit inqas minn 1600. Dak il-warning il-PN ma tax każ tiegħi. Minflok ma daħal f’qoxortu l-PN immexxi minn Lawrence Gonzi żied id-doża tal-arroganza tiegħu. F’Marzu 2008 l-PN seta jibda l-proċess biex jitnaddaf. Biex isewwi l-ħsara. Iżda minflok baqa’ għaddej bħal bulldowzer minn fuq kulħadd. Jiena irreżenjajt mill-PN f’Jannar 2008. M’għandi l-ebda dispjaċir. Dakinnhar u fil-ġimghat ta’ wara l-PN seta janalizza x’ġara u kieku ried kellu l-għodda biex isib ir-rimedji. Mhux bil-paroli iżda bil-fatti. Billi jwarrab l-arroganza. Minflok iżda, żied id-doża. Minflok flimkien kollox possibli l-PN għażel triq oħra. Triq li jqis lil kull min ried inaddaf u jsewwi bħala għadu. Mill-mument li għażel dik it-triq it-tkaxkira kienet inevitabbli.